So the baseball season is underway and as I like to do I’ve been enjoying my free preview of the MLB Extra Innings package. I like being able to go from game to game and see how all the games are going. I just enjoy watching the teams from the different markets that I won’t see much of as the season moves on. I also enjoy listening to which ever teams announcers are doing the game. Dan the Man is so jealous that I was able to watch all of these games while he had to work. Some of the surprises I caught while checking out all of these games. The Houston Astros winning their opening series against the New York Yankees. The Seattle Mariners sweeping the Los Angeles Angels of Anaheim. I saw Aaron Harang and Matt Garza pitch against each other and have dueling no hitters for 6 2/3 innings. The Chicago Cubs Emilio Bonifacio tied a 100-year-old major league record by getting nine hits in the Cubs first two games this season. Bonifacio is 11 for 19 this season as is Miami Marlins shortstop Adeiny Hechavarria. Bonifacio also has four stolen bases to start his season. 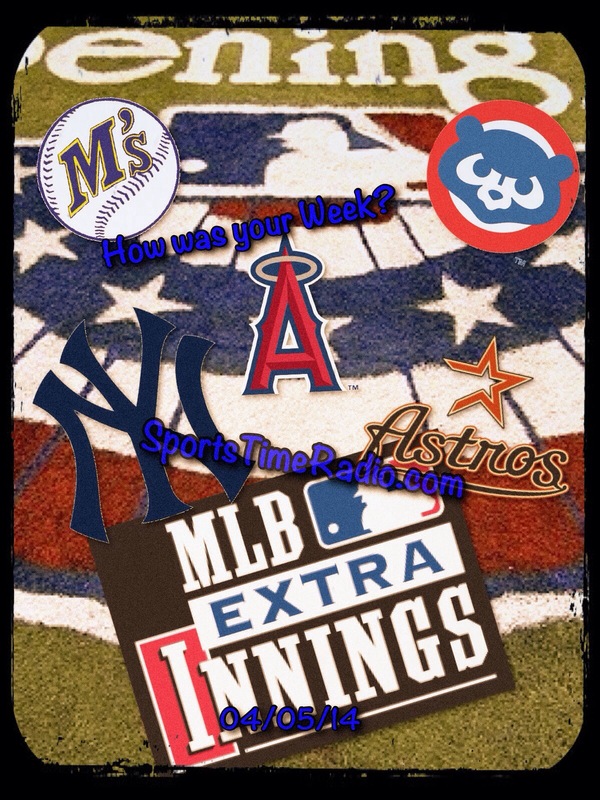 Did you have Brandon Belt or Alejandro De Aza hitting three home runs this week? While You wouldn’t expect these players to end up at the top of these hitting categories by the end of the season I did have a good time watching Colorado Rockies center fielder Charlie Blackmon go 6 for 6 yesterday against the Arizona Diamondbacks. Blackmon had three doubles and a home run among his six hits in the Rockies 12 – 2 win. While I was watching baseball game after baseball game Kevin Durant was tying Michael Jordan’s record by scoring 25 points in a game for the 40th straight time. Durant’s team the Oklahoma City Thunder ended the San Antonio Spurs 19 game winning streak during the week. Even with the win the Thunder are still 3 1/2 games behind the Spurs for the #1 playoff spot in the Western conference. The battle in the West will be for the 6th, 7th and 8th spots. Right now the Golden State Warriors are in 6th; the Dallas Mavericks are in 7th and the Memphis Grizzlies are holding the 8th spot. The Phoenix Suns are the odd team out right now, but have the same record (45 – 31) as Memphis. Dallas is only one game ahead of them in 7th; while Golden State is two games ahead of them in 6th. Even a 5th seed isn’t out of these teams reach as the Portland Trailblazers are just four games ahead of the 8th seed. While a team with a winning record will miss the playoff in the Western conference a couple of teams at or below .500 will make the playoffs in the Eastern conference. The Charlotte Bobcats hold the 7th Eastern conference playoff spot and are 38 – 38. The Atlanta Hawks are in the last playoff spot right now, but the New York Knicks are just a game behind the Hawks and the Cleveland Cavaliers hanging around just three games back of the 8th playoff spot. With only a couple of weeks left in the regular season the race for these last couple of playoff spots will make things interesting. The NHL regular season is coming to a close as well and they have a couple of good playoff battles going on. In the Eastern conference it looks like 5 teams are going to battle it out for just 2 wild card playoff spots. The Detroit Red Wings (88 points) and the Columbus Blue Jackets (85) hold those wild card spots, but the Toronto Maple Leafs (84) are just one point out of a wild card spot. The New Jersey Devils (82) and the Washington Capitals (81) are still trying to grab a wild card spot. In the Western conference 6 of the 8 playoff spots have been locked up; it’s just the two wild card spots that are up for grabs. It looks like the Minnesota Wild are going to take one (1) of those wild card spots with 90 points this season and a four (4) point lead in the wild card standings. Right now the Phoenix Coyotes (86) hold the other wild card spot, but have just a one point lead over the Dallas Stars (85). 3/29/14 How was your Week? 4/12/14 How was your Week?